Geilsk is a brand from Denmark, with the attitude that it is alreight to be different. From the logo drawn by the owner's son to the yarn blends, this company is proud to be unique. Tweed - 100% wool single-ply with tweed flecks. Tynd Uld - 100% wool in rustic heathered colours. 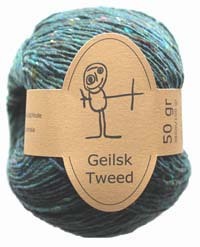 Bomuld og Uld - wool/cotton blend.